We love getting feedback from our clients – both good and bad. If we’ve missed the mark, we want to know, so that we can fix things and make it right. And if we’ve done an amazing job, we love hearing that we’ve done great, too. 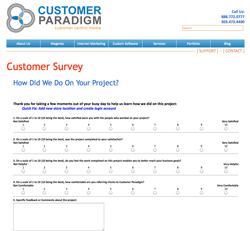 Since 2002, Customer Paradigm has completed more than 10,250 projects for our customers. Some projects were quick, 1-2 hour quick fixes for Websites. Others were many, many months and involved hundreds of hours of time to complete. Overall, we’ve made a lot of people happy with our work, and logged more than 220,000 programming hours in the process. After each project is complete, our system sends a request for feedback through an online survey. We worked with an industry expert to help develop a quick but effective survey that allows us to identify happy clients. How satisfied were you with the people who worked on your project? Was the project completed to your satisfaction? Do you feel the work completed on this project enables you to better reach your business goals? How comfortable are you referring clients to Customer Paradigm? We also ask for specific feedback or comments about the project as well, in a free form text box.